Head Start Lessons, Grade Level Debate, Discipline Debate, New Mexico Debate, Janus Fallout, More! Ashley LiBetti on Elizabeth Warren and Head Start – and Head Start lessons. The lessons are drawn from this new Bellwether analysis of leading Head Start programs and the lessons they offer. Well worth your time. At Bellwether we do some work with New Classrooms Teach to One and we also have a lot of concerns about the equity implications of walking back the emphasis on grade level standards but this is an important issue to discuss because it’s not straightforward and there are real tradeoffs. It’s possible they are canaries. Michael Horn on all that in Forbes. [Broward School Sup’t] Runcie disputes that the discipline matrix is too soft on kids. But Fitzgerald, the former Sunrise Middle school teacher, thinks discipline has become lax. “A lot of principals are afraid,” she said. “You don’t report theft because reporting it makes your school look dangerous. Keeping kids safe seems like a reasonable minimal standard for schools everyone should be able to agree on. Safe bet you won’t see The Producers in Sioux Falls next year. More girls playing ice hockey. We’re hiring at Bellwether for a pension analyst, great role on an important issue. We just released our annual report so you can learn a little more about how we do things. Lynne Graziano on Rebecca Lee Crumpler. What would happen if a state stopped enrolling new teachers in its pension plan? Kirsten Schmitz on Alaska. Chad Aldeman on how Boston is a microcosm for U.S. education trends. Big school choice announcement from the Trump Administration (the funds could be used for activities beyond school choice but that’s the headliner). Ordinarily, and historically, when multiple choice options are in play it’s generally good news for public charter schools. Some of the earliest charter laws passed as a third way compromise in the face of real pressure for school vouchers and that dynamic still shows. In this case, however, it’s sort of an open secret that President Trump doesn’t care much about education and that even within his administration there are disagreements about the merits of the tax credit policy. What’s more, it’s hard to see an action forcing mechanism to make the threat of this legislation credible or to see a Democratic House acting on it. In normal political times you’d never discount a presidential priority but this isn’t a priority and these are not normal times with a president who can stay on any message for long. Counterfactual: It would have been fascinating to see a serious school choice plan from the administration – focused on blue cities and with real money behind it. This is not that plan and why it’s more likely to be a good Democratic talking point more than much else. Meanwhile, the Trump branding is not helpful for school choice more generally but is a boon for the teachers unions. Good times. Check out what Emma Vadehra is up to with Next100. If you missed this EdBuild report, don’t. And if you missed this NCTQ report, don’t. The Economist on broader teacher strike dynamics. More pension debate in Kentucky. About two-thirds of Kentucky teachers get some pension, and more than 40 percent of Kentucky teachers reach the normal retirement age in the profession – far higher than most other states. (Although, like some other states, the situation is getting worse for new teachers as a way to shore up the pension plan). Pretty good CA strike summary here. In introducing the bills now, O’Donnell and the co-authors may be moving ahead of State Superintendent of Public Instruction Tony Thurmond, whom Newsom has asked to create a panel of experts to look at the financial effect and other impacts of charter schools. Newsom was responding to the Los Angeles Unified school board’s request for a moratorium on new charters in Los Angeles while the state considers changes to the state charter law. The as yet unnamed commission is to recommend its changes by July 1. Here are two good Mardi Gras stories with an education flavor to them. Periodically students decide not to stand for the Pledge of Allegiance and school officials do stupid stuff like escalate the situation and have them arrested. And then everyone gets a soap box. What’s amazing, though, is that there is – literally as the kids say – Supreme Court precedent on this. And it’s not recent. Kids don’t have to stand. That this is even a thing is a good reminder of the sprawling nature of our educaiton system. Are funders souring on K-12? Another charter boarding school in D.C.
New Bellwether analysis of Boston out today. 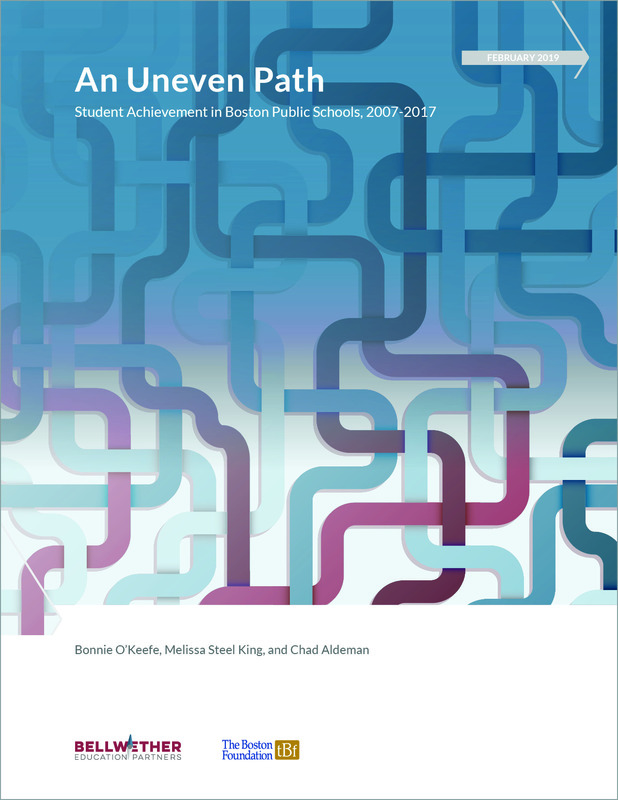 An Uneven Path: Student Achievement in Boston Public Schools 2007-2017 finds that Boston students outperform their peers in other cities on performance tests, but that a decade of tight budgets, aging facilities, and persistent achievement gaps in the city have narrowed Boston’s lead over its peers. The paper looks at testing and graduation data, supplemented by interviews with key education stakeholders across the city, to examine policies and issues that provide context for the district performance. 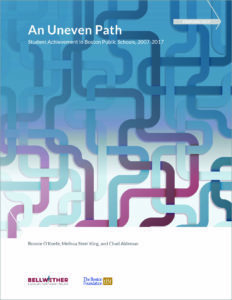 The authors find that Boston has made progress in some key areas over the last decade — such as high school graduation, college completion and pre-K enrollment. Boston also typically ranks among the top large urban districts in the National Assessment of Educational Progress’ Trial Urban District Assessment, although scores have plateaued or even declined in recent years. Kelly Robson on last week’s homeless news and the broader implications. Today in civics. Here’s a good story. Teachers, Homelessness, Science Projects, DC, More! Phillip Burgyone-Allen on how charters and traditional schools are not as different as you might think…. if you are in Boston next week Bonnie O’Keefe will be talking schools. Bellwether’s annual report for 2018 is out this week. Kate Walsh on teacher knowledge and licensing tests. Yesterday we talked about paying teachers more, this new Rick Hanushek has an international lens on that. Homelessness is a substantial problem, and an acute problem for some children. At Bellwether we do a variety of work on challenges affecting disconnected youth and homeless students are an important part of that population. 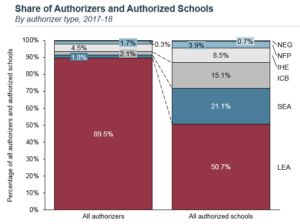 That said, I am skeptical homelessness is up 70 percent among students over the past decade, this seems likely to be an outgrowth of districts doing a better job identifying homeless students. Mark Simon thinks we should listen more to teachers and parents in DC. Yes! OK, so here’s what teachers say about why they are leaving DCPS and it’s not what you might have heard on Twitter (and here’s one of several evals of the IMPACT program) and about 50 percent of DC parents say they want school choice – because they’re using choice options (and a whole lot more use residential choice to get the schools they want). Jackson’s father, Chris Oswalt, had no real understanding of what his son was working on. 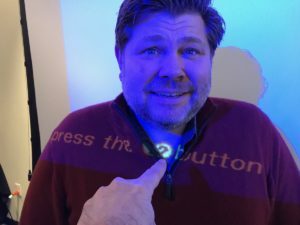 To make sure Jackson was safe he had experts speak to him about the dangers involved with working on a potentially deadly fusion reactor, like being exposed to high levels of radiation or being electrocuted by the 50,000 volts of electricity he uses to warm the fusion reactor’s plasma core. At Bellwether we released our annual report – you can see some highlights of our past year here. Tax Policy And Teacher Shortages, Plus Ward On Culture, CREDO On Ohio, Kettleman On Reading, Pearson Sells, More! We released our annual report today, look back at some of what we did at Bellwether in 2018. Lynne Graziano on an amazing school leader. Tresha Ward on school culture and tools to help school leaders think about culture intentionally. Ryan Frailich on the myth of the gold plated teacher pension. Max Marchitello on how longer life expectancy for teachers is good news but good news with a cost. Also, just a reminder, the teacher shortage rhetoric you’ve been hearing and reading isn’t quite right. Teacher shortage crisis is an almost surefire way to get a headline, it’s just an awkward fit with the facts on the ground. If every state were Ohio it would be understandable if few people thought public charter schools were a really good idea – this new CREDO report on Ohio released last week has bright spots, the results for low-income African-Americans are important, but is overall pretty grim – and the online charter schools remain an enormous problem there. Thankfully, Ohio is not representative (and online charters skew the data ), here’s a January Bellwether deck with a comprehensive look across the sector. Speaking of charters, this article overstates things but a real issue is some shady real estate deals and other sweetheart deals. Yes, sure, there are shady deals all around the education sector but that’s not much of a defense, and charter advocates need to take the lead in cleaning up some of the problems before they become headlines because it should be obvious by now that politically one bad example offsets dozens of good ones. Seems unlikely we’ll get through the presidential campaign season without some proposals to exempt teachers from income taxes – here’s one from former Senator Bob Kerrey and Leo Hindrey Jr. A few years ago Kaitlin Pennington and I took a look at a similar push in California and the basic idea applies here, too. There are plenty of places where we should be paying teachers more but the optimal way to do that is to, well, pay teachers more. Carving workers out of the tax code isn’t sustainable or a path to a respected profession. Kerrey and Hindrey give the game away when they compare their idea to policies for Peace Corps and VISTA volunteers, enormously worthy work but not the professional work that teachers want to be seen as (remember, a key talking point against Teach For America is that teaching is not like the Peace Corps). There is some promise in targeted tax incentives, I’d argue that housing is a place where targeted tax credits could accomplish a few goals at once in some communities, but just exempting classes of workers from the tax code is a great soundbite but lousy policy. Almost two years ago we talked with Pearson CEO John Fallon about the digital direction he was taking the company and plans to sell Pearson’s instructional materials business. That sale has happened to an investment firm. Buzzy Kettleman on the foundational nature of reading. And Zig Engelmann has passed. Appropriate that this remembrance is by a guy from Australia because the establishment here marginalized him at every opportunity. Worth reflecting on how the education equivalent of climate deniers thrive in this sector but someone like Zig was fought at every turn. Also seems kind of amazing there are about the same number of schools named for James Buchanan as for FDR…. One takeaway from an interesting Fordham look at school names. There are no schools named after Trump yet, but perhaps there should be? Great moments in interdisciplinary teaching. Use some judgement out there people. School Transportation And Condiments Plus Context Bonanza: Oakland Strike Context, Teacher Pension Context, Teacher Environment Context, Congrats Curtis Jones, Does Cory Booker Have A DeVos Problem? More! Cara Jackson on what environmental factors matter most to new teachers. Mia Howard on growing a charter network to multi-site. Chad Aldeman on why failing to account for attrition is a misleading way to analyze pensions – and masks the bad deal a lot of teachers are getting from their pension plans. This sounds arcane but is really central to the discussion about teacher retirement. If there is a teacher strike we’ve got fiscal context. Here’s Max Marchitello looking at the situation in Oakland. Lauren Camera thinks Cory Booker has a DeVos problem. Your periodic reminder that for all the hand-wringing about TFA as Trojan Horse for left wing politics they are also dealing with this stuff, too. Hope they can keep a good sense of humor about it. First, if all it takes to be a brand consultant is saying things like, “Hey, Mustard is a really lousy name for a school transportation company, that won’t connect with parents and will confuse everyone” and then presumably upselling them to advice about staying away from all condiment names, I guess being a brand consultant is not nearly as challenging as I had assumed. Sanford & Friedman, Curriculum Mapped, Yale Sued, Papers Posted, Pension Roller Coasters And More! Chad Aldeman on the pension roller coaster NY teachers are on. Max Marchitello on how the year of the woman hasn’t caught up to education pensions yet. Thomas Friedman on Stefanie Sanford. (Come for Sanford, stay for the civics idea). ACCT on community college and options for rural men. All the papers from the recent CALDER conference are online now, some interesting work. The other day we talked about a teacher who is sort of a celebrity among gamers. Here’s another gaming story with a less happy ending. Denver’s 100% Predictable Strike, Rahm’s History, James Foreman Jr.’s History, Alliance College-Ready Looks Forward, Treat Them Like Athletes, Gaming Teacher, More! Kate Pennington on teacher shortages. Bellwarians reflect on gym. Jason Weeby on ten lessons from “Eight Cities.” Ashley LiBetti on The Times’ early ed coverage. Denver teachers strike. Of course. There was never not going to be a strike and if you’re a teachers union and you’re not rattling the cage to strike then you’re doing it wrong in 2019. What’s concerning is that while ProComp is hardly perfect it’s driven some real progress in Denver on equity. That’s at risk. Here’s fiscal context from Chad Aldeman. We are in a period of societal and political realignment. But part of any process like that is various actors trying to get their marks down or to shape the narrative – in sometimes ahistorical ways. For instance in the Atlantic outgoing Chicago Mayor Rahm Emanuel gets on education reformers for ignoring the role of principal autonomy. Nevermind that reformers like Paul Hill were hammering on this issue back when Rham himself was a student, one of the first education reform crown jewels was called, “New Leaders for New Schools.” I’ve been doing this long enough to remember when the reformers were not paying attention to principals, paying too much attention to principals at the expense of other issues, and I’m sure there was probably one blessed day when everyone paid just the right amount. I also don’t get the part about how reformers don’t honor good public schools? Literally, multiple books have been written about this from various parts of the reform world and it spawned a whole cottage industry of debunking them or arguing why such schools were unicorns. Seriously. In any event, Rahm makes a good point about conservatives and wrap-around services (the gaps between do as I do and do as I say in education are quite wide!) but leaves out the part that most affluent elites on the political left, very much including the anti-reform crowd, would never let their own kids anywhere near a Chicago public school despite the progress made there on Rham’s watch and before it. And Chicago still doesn’t have some of the basic things, like keeping kids safe, down yet – nor do most districts. Plenty of work to do without all the revisionist history we’re getting lately. Here’s Alliance College-Ready Public Schools on to and through college efforts. Here’s a blast from the past on both autonomy and Denver. James Foreman Jr. on school choice, empowerment, and history. This PDK look at the views of parents on diversity in schools has some interesting nuggets in it. Obviously I like this take that when colleges say they don’t quite know how to support first-gen and other students at risk of not graduating they’re often ignoring lessons from their own athletic departments. High school math teacher is quietly a gaming hero. Talk about using your hot stove time well. This is Kevin Kosar’s daughter. And she’s tying a wooly bugger. Herself. 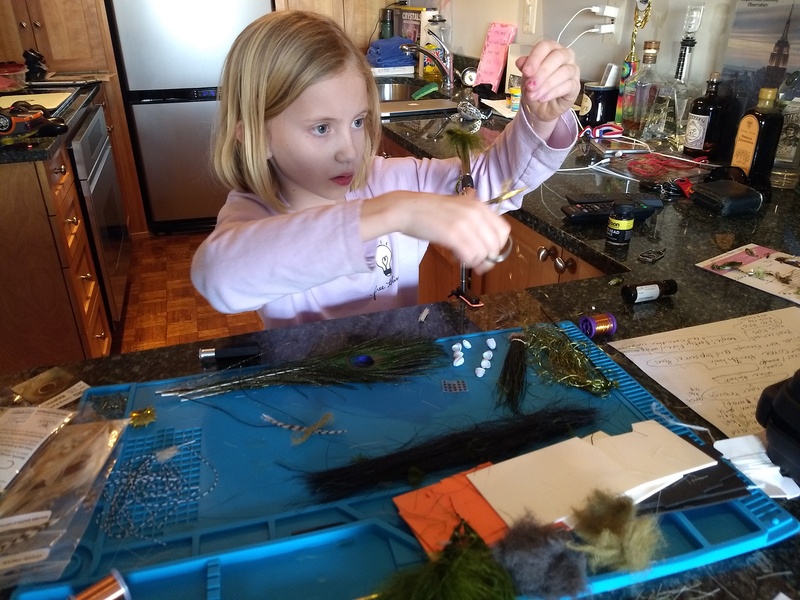 So while it’s not a picture of her with a fish, she’s been featured here before with fish, along with her dad, and a kid tying a fly would be more than good enough anyway – not a skill I have. She asked for the fly tying kit for Christmas. More, please! Looking for more hot stove fish action? OK, here and here are hundreds of pictures of education-connected people, including the fishing Kosars, with fish.